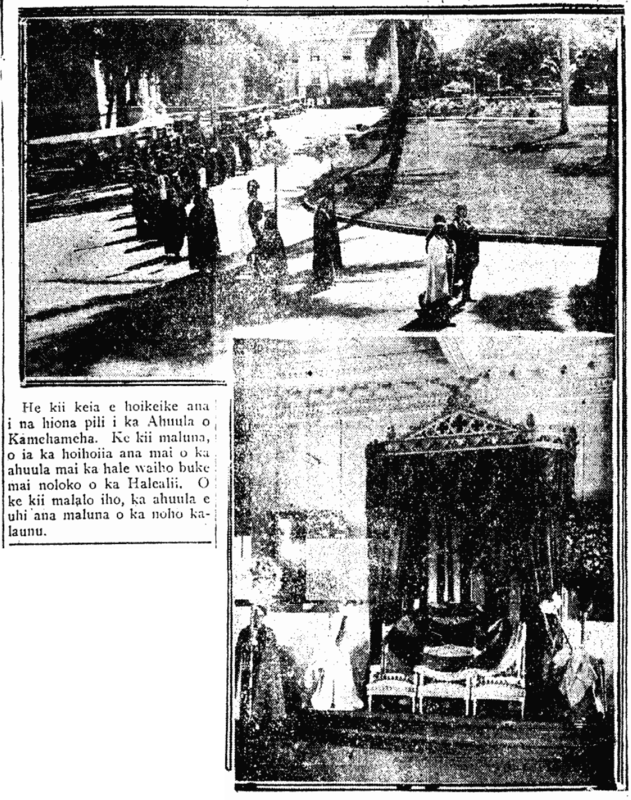 Images of the return of Kamehameha III’s ahuula, 1927. This is a picture showing scenes of the Feather cape of Kamehameha. The picture on the top is the return of the ahuula from the archives to within the Palace. The picture below is the ahuula draped upon the throne. Ka Nupepa Kuokoa, Buke LXVI, Helu 53, Aoao 1. Dekemaba 1, 1927. This entry was posted in Alii, Clothing, Illustration and tagged ahuula, feather cape, hale waiho buke, Iolani Palace, Kamehameha III, Kauikeaouli, Lawrence Kearny by nupepa. Bookmark the permalink.